Please ensure that the details entered into these boxes is accurate as they may need to be referred to at some point in the future. Please ensure that you enter your unique serial number here carefully to avoid problems with licensing. 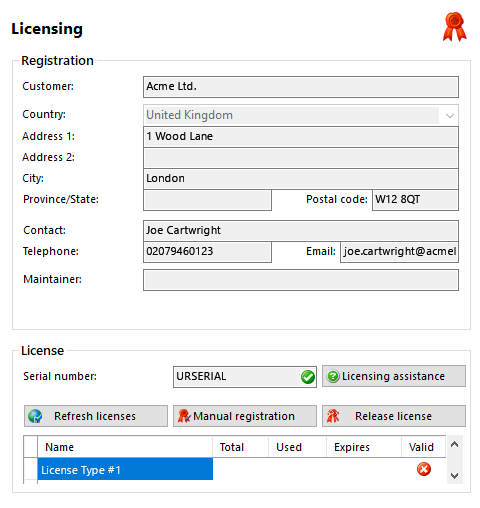 If your existing license has been upgraded in some way, you can click the 'Refresh licenses' button to re-load the updated license information from the Internet. You will need to have an active internet connection. If you do not have internet connectivity you may add new licenses manually. 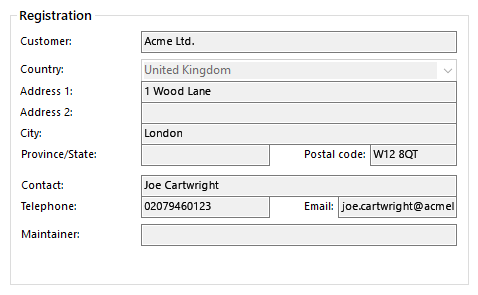 To add another license, press the 'Manual Registration' button and enter the code that you have been provided with. If you have not been provided with the unlock code please get access via an internet enabled device to the website link provided where you can obtain the unlock code(s). If you have previously registered ucplus and you want to move the software to another computer then you must release the software from the original machine. To do this, press the 'Release license' button and write down the code that you are given. Before installing ucplus on the new server you must make your ucplus Maintainer aware that you are moving the license. They will need the serial number and the release code you have been provided. The steps below should be used when migrating an existing ucplus Server configuration to a new machine. It is assumed ucplus has been installed on the new machine prior to these steps being undertaken. Logon to the original ucplus server, release the license and note the release code. Contact the ucplus support team and provide them with the serial number and the release code from the original ucplus Server. Navigate to C:\Program Files\Microsoft SQL Server\MSSQL.1\MSSQL\Data\ and check to see if the UCServer.mdf file exists at this location. * If it does not then search computer for this file and navigate to the directory located by the search. Copy the UCServer.mdf and UCServer_LOG.ldf files to a secure location as they will be used later. Paste the saved UCServer.mdf and UCServer_LOG.ldf from the original ucplus server to this location which should overwrite the newer, existing files. * This is the default location of the database files for version 2.3.10 and older of ucplus. It assumes that no other instances of SQL had been installed on the machine prior to the installation of our software. The exact location of these files is controlled by SQL and can change. ** This is the default location of the database files for version 2.3.17 and newer of ucplus. It assumes that no other instances of SQL had been installed on the machine prior to the installation of our software. The exact location of these files is controlled by SQL and can change. Click this button to view additional help with licensing. Once registration is complete, you will see a list of active licenses appear. If this list is not correct please contact your software supplier.